We literally have a blank canvas for a backyard right now, which is pretty exciting! But also very…confusing. What to do, what to do? Our house is on a corner lot, so I think we have a bit more space than others around us in the subdivision, and there’s nothing in the backyard at all…but it’s also not fenced in. Making our two biggest outside projects on “The Master House To-Do List” fencing in the back yard and pressure washing/re-painting the house. And once the fence is up, anything goes! So I’ve been doing a little dreaming. Tell me what ya think of my jumbled ideas! Let me add that we already have a screened-in back patio that we LOVE. We also have a brick patio off the screened-in patio that will turn into more of an entertainment area (fire pit, etc.). That’s why you won’t see those kinds of ideas in this entry! I’m not the best gardener, that’s for sure, but I love the “idea” of gardening. (I know, that doesn’t help much, does it?) But I’d really like to try to make a concentrated effort at least once more before I give up completely, ya know? 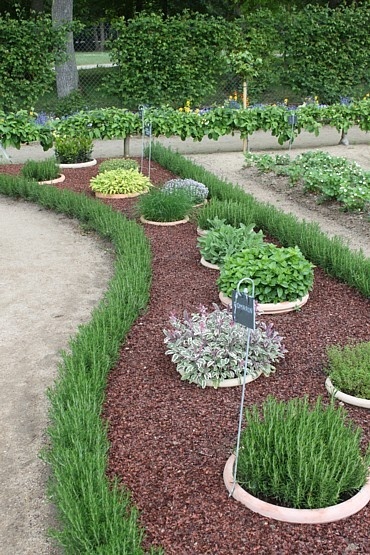 Herb garden in sunken pots: I would love to use more fresh herbs in my cooking than dried and bottled, but this is lots of work!